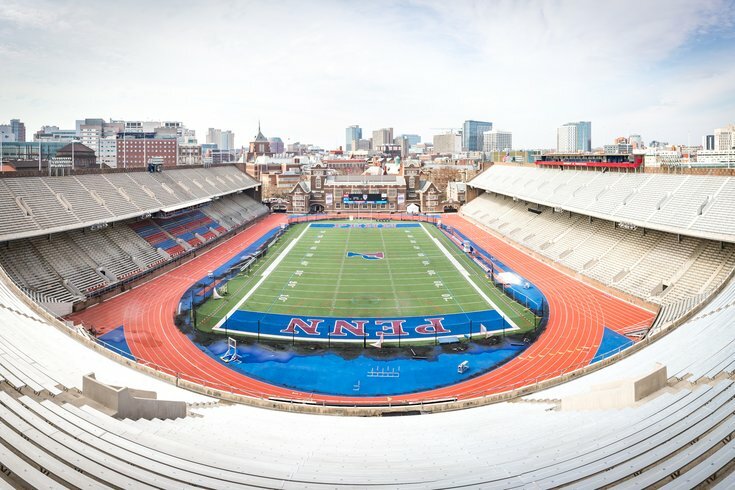 A panorama of Franklin Field at the University of Pennsylvania. As universities across the country send the Class of 2018 into the working world this month, the American Bar Association is shedding light on which of last year’s law school graduates have had the best employment success so far -- with some promising statistics for Philadelphia-area grads. Four local universities managed to surpass the national average (69 percent) of 2017 graduates employed in full-time jobs that require passing the bar exam, including the law schools at the University of Pennsylvania, Temple University, Villanova University, and Drexel University. Penn Law had the highest employment rate among the schools, at 90.6 percent. Penn was also the only school in all of Pennsylvania that had more than half its graduates employed at large law firms. A reported 78.5 percent were placed in elite positions. On a broader scale, the Bar Association also considered full-time jobs that required bar passage or where a law degree was an advantage. Penn led the country’s law schools with a 98.8 percent employment rate in that broader category. Temple's Beasley School of Law had the second most promising outcome reported among local schools. Of Temple’s 2017 law graduates, 79.2 percent were placed in bar-required, full-time jobs. The number of students placed in elite positions, however, was a distant second to Penn, with 21.7 percent. Eighteen percent of graduates were placed at large law firms. Seventy-one percent of 2017 law school graduates from Drexel's Thomas R. Kline School of Law found work in full-time, bar-required positions. At Villanova's Charles Widger School of Law, the rate was 75.4 percent. Not all area law schools had as promising results. Widener Law Commonwealth in Harrisburg and Widener University Delaware School of Law had two of the lowest full-time employment rates in area firms, at 67.2 percent and 59.6 percent, respectively. Widener excelled in other areas, however, with Widener Commonwealth having among the highest state percentage of graduates headed to roles in government or public interest, at 21.3 percent. Widener Delaware was a leader in state and local clerkships, with 25.7 percent of graduates going into jobs in that sphere -- the fourth highest rate in the country. For federal clerkships, Pennsylvania produced only a few, with most -- 28 -- coming out of Penn. Penn State Dickinson Law had three. Want more details on a particular school of interest? Comb through Class of 2017 stats by school at this American Bar Association database.